Sonoma Compost's recycled soil products are specified by our region's most talented and creative landscape architects and contractors. Many of our most attractive wineries, parks, commercial properties, schools and residential landscapes have been installed using our compost and mulches. Landscapers amend Sonoma Compost, Organic Hi-Test Compost or Mallard Plus into the soil to create the growing conditions required for newly installed turf, shrubs, trees and flowers. They use our Vineyard Mulch on the soil surface in areas planted with ornamental shrubs or trees to conserve moisture, control weeds and moderate soil temperatures. Vineyard Mulch (coarse or screened) also provides an attractive backdrop, especially for landscapes featuring vibrant colors. 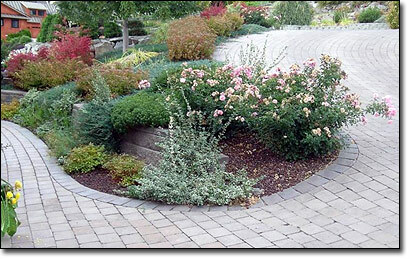 Path Mulch is great for creating quick and easy paths in a landscape. It’s a long lasting walk-on mulch that's an attractive, affordable substitute for expensive products made from virgin forest products. It has a lighter color, which can create a stunning contrast to darker soil. If you're wondering which of our products will look best in your landscape, please visit our demonstration garden and feel free to take home some samples.